Toxic chemicals in your water? A simple water filter will remove them. Nearly all municipal and community water supplies are regulated by State and Federal agencies, and periodic testing of the relatively short list of contaminants regulated by the U.S. Environmental Protection Agency provides some degree of consumer protection. What we aren’t told, however, is there are thousands of unregulated and unmonitored chemicals in our water systems. This is especially true of water systems that obtain their raw water from rivers and lakes downstream of other cities, industrial facilities and agricultural operations. These raw water sources may contain any number of toxic chemicals, pharmaceuticals and micro-organisms that are not regulated or even monitored. Untreated storm runoff can be another significant source of harmful contaminants. And many of the more exotic contaminants can pass through conventional water treatment processes with very little reduction. And keep in mind that water coming out of your tap may not be as safe as that leaving the water treatment plant. After leaving the treatment plant, the quality of your water can be affected detrimentally by formation of disinfection byproducts (such as trihalomethanes, haloacetic acids, bromate and chlorite), by infiltration of contaminants into the distribution system and by leaching of lead and other chemicals from the distribution system into your water. Water from private wells that serve individuals and small groups is entirely unregulated and unmonitored by local governments, so it's up to homeowners to test and monitor the safety of their water. Well water sources are susceptible to contamination from septic systems, farm animal runoff, and pesticides and herbicides in the surrounding area. 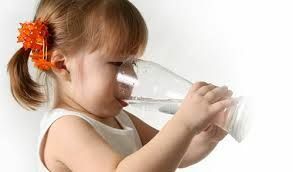 Well water also can have high levels of dissolved minerals such as calcium and magnesium which results in "hard" water. For all these reasons, it's wise to take steps to protect your family from the health-threatening effects of potentially contaminated drinking water. A simple filtration device, such as the AquaCera counter-top drinking filration system configured with a CeraMetix filter element is the way to gain the peace of mind that comes with clean, safe drinking water. ​The AquaCera HCP CeraMetix counter-top drinking water filter system is a free-standing, single-stage filter system. Its compact size and superior performance make it a good choice for your home, but it's also great for apartments, boats, RVs and second homes. And it's an excellent alternative to costly bottled water, reverse osmosis, distillation or ion exchange technologies. Constructed of durable acetal and polyester materials, the filter housing holds a single replaceable filter element and it comes with of a CeraMetix filter element. This ceramic filter element can be cleaned by simply scrubbing the surface of the filter with an abrasive non detergent scouring pad. This means extended filter life and less filters to replace. The HCP counter-top drinking water filter system allows filtered or unfiltered water to be drawn from your existing standard kitchen faucet. It connects easily to your standard kitchen faucet via an included diverter valve with no tools, and it requires no electricity or permanent modifications to your plumbing. To obtain filtered water, you simply turn the knob on the diverter valve to direct water through the filter and filtered water is delivered through the attached spout. When you turn the diverter knob back, unfiltered water will flow again from the faucet into the sink. NOTE: This system qualifies for free shipping within the continental U.S.
• Other filter options for the HCP counter-top system are available here. • Other counter-top water filter systems are available here. • Several under-counter water filter systems are available here. 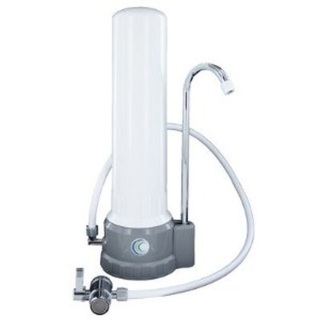 • Several gravity water filter systems are available here. The CeraMetix water filter element is a silver impregnated ceramic micro-filter. Advances in the ceramic filtration manufacturing processes have resulted in a highly effective and efficient means of treating a wide range of waterborne contaminants. Modern manufacturing practices give the ceramic element a controlled and consistent pore structure. And the inclusion of silver gives the filter element bacteriostatic, self-sterilizing properties. The CeraMetix filter is a unique blend of proprietary ceramic technology with powdered activated carbon media molded into a one micron-rated block and is the most advanced ceramic filter available. It uses the AquaMetic core technology to offer all the benefits of the ceramic pre-filter shell plus the reduction of aluminum, arsenic, cadmium, chloramines, chlorine, cysts, fluoride, lead, mercury, nickel, radionuclides, silver, tri-halomethane, VOC’s and zinc in a revolutionary block core.